Don’t let Normandy’s quaint cobbled towns and quiet pebble beaches deceive you: the French region has long played a central role in European history. It was famously conquered by Julius Caesar in 56 B.C., and invaded by the Vikings almost 900 years later, who lent it the name ​‘Normandy’ after their Northern heritage. Since then, this coastal duchy has been plagued by major battles featuring legendary names like William the Conqueror and Joan of Arc. While history enthusiasts are kept happy, there’s equally plenty to satisfy those with more epicurean appetites. Both the indulgent Coquille St Jacques – king scallops in a creamy sauce topped with Gruyère cheese – and the Canard à la Rouennaise, a succulent duck dish cooked in cider, originate from this region. These culinary classics and many more provide the perfect sustenance for a day spent exploring Normandy’s many historical sites. Here are our top places to visit to help you paint your own picture of Normandy’s vivid past. Study the architecture of the Joan of Arc church. Credit: Flickr/​Marko Kudjerski. French heroine and martyr Joan of Arc has become an integral figure of the Hundred Years’ War since she was burned at the stake in 1431 in the city of Rouen. In the spot where she was executed in the Place du Vieux-Marché stands the Church of St Joan of Arc. 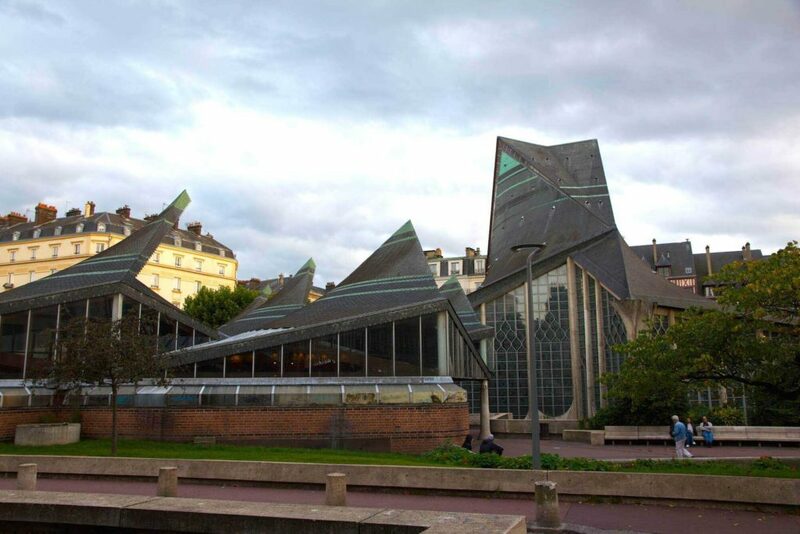 This modern structure was created in 1979 by Louis Arretche, an architect who helped redesign many of the city’s bombed buildings after the Second World War. Make sure to go inside the Joan of Arc church too – the inside is just as impressive as the outside. Credit: Getty Images/​AWL Images RM. 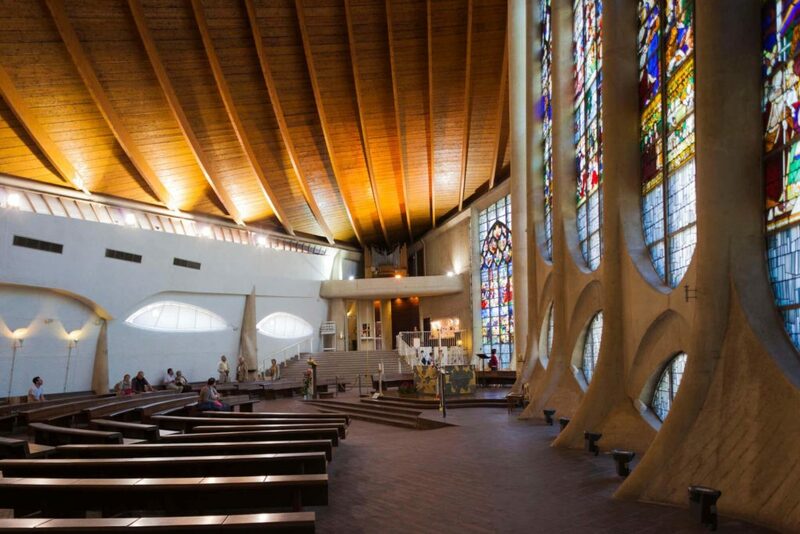 In his plans for the church, Arretche decided to reconnect with an old Norman tradition of shaping the form of the building like an overturned boat, but instead with smooth, modern curves. These contemporary features are cleverly blended with a collection of carefully preserved 16th-century stained glass windows that were saved from the Church of St Vincent after it was destroyed during the Second World War. One particularly striking window from 1530 shows the Crucification cast in deep, oceanic blues. Once you’ve exited the church past its verdant flower and vegetable garden, head to La Couronne restaurant on the southern edge of the square. It’s only moments away and serves a fresh, flavour-packed langoustine salad. Photo by Simon de l’Ouest via Wikimedia Commons. As one of the most infamous battles of the Second World War, the D-Day landings on June 6th 1944 sowed the seeds of defeat for the Nazis, but at a great cost to both sides. 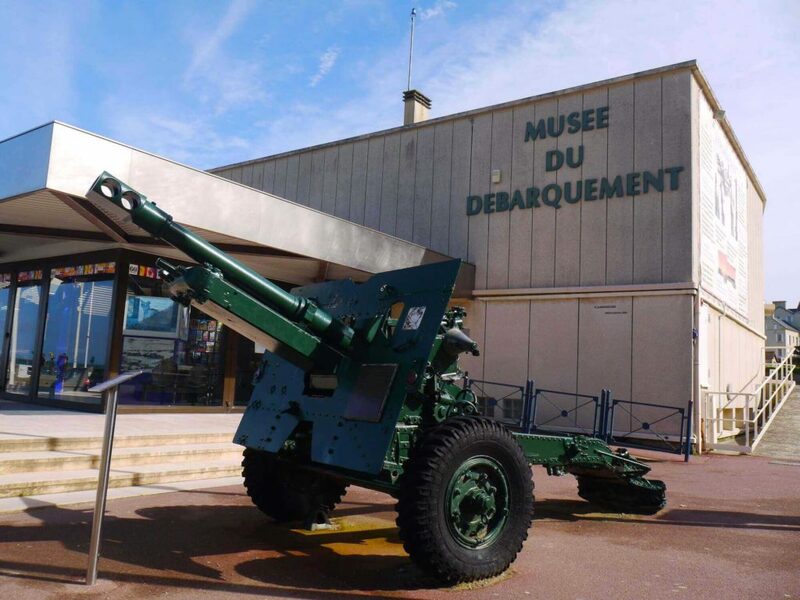 Only ten years after this historic event, The D-Day Museum – or the Musée du Débarquement – was the first of its kind built to commemorate the landings. Take a trip to the site of the Mulberry Harbour. Credit: Getty Images. 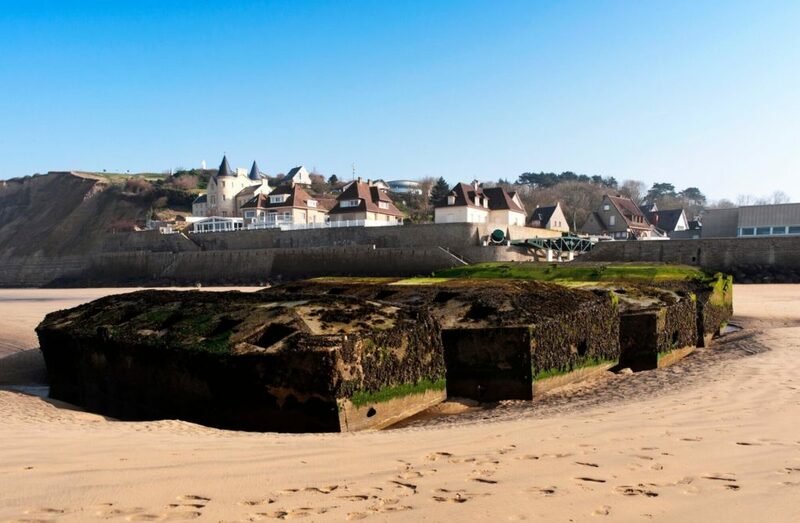 Situated at Arromanches-les-Bains, an area that was code-named ​‘Utah Beach’ during the invasion, this museum is one of the most visited sites in Normandy. The building rests on the original spot of the artificial Mulberry Harbour: a series of floating roads and pier heads constructed in under nine months by the British and that rise and fall with the tide. Inside you’ll find a detailed diorama, complete with lighting and sound, showing the timeline of D-Day brought to life. Equally, the Hall of Allied Nations is a treasure trove of preserved uniforms, maps and equipment from each of the nationalities that took part in the siege. The Claude Monet Foundation. Photo by Andy Hay. 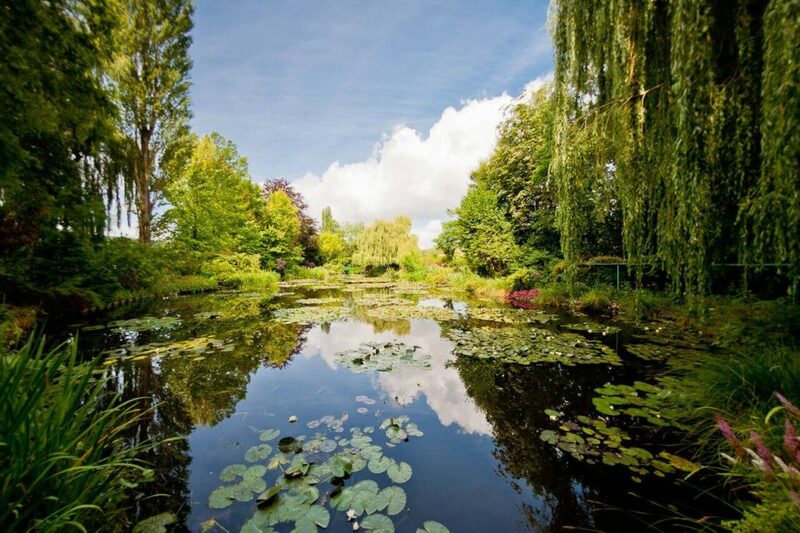 French impressionist painter Claude Monet lived in his Giverny house for over 40 years until his death in 1926, and painted plenty of works here, including his water lily series. The green-shuttered house sits amongst the colourful gardens he cultivated himself and just across a small road from his iconic lily ponds. Here visitors can even walk over the Japanese footbridge and watch the coy carp swim amongst the bamboo shoots and along the edge of the paved walkways. 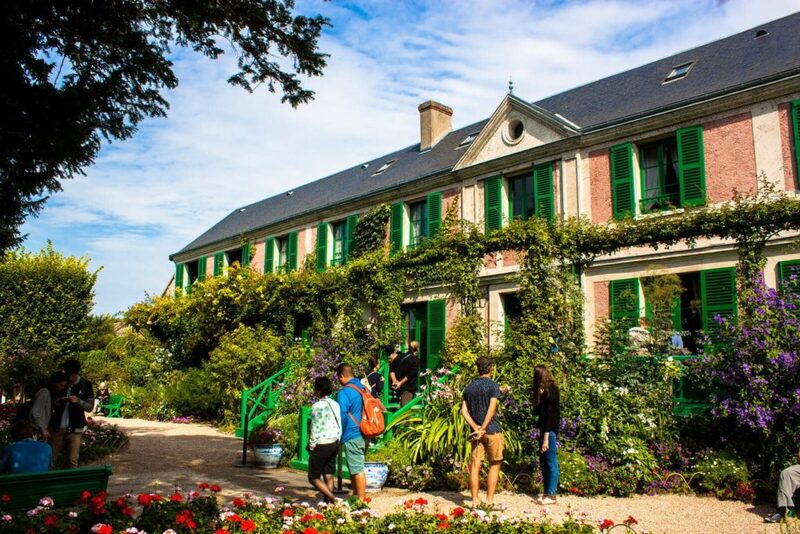 Stroll through the garden of the Claude Monet Foundation. Photo by Flickr-user Mat’s Eye. Delve into the house and studio of this great master and you’ll learn even more about Monet’s love for Japanese art. His wide collection of prints adorn the walls of his butter yellow dining room and his multiple panelled salons. After your visit, head to Les Nymphéas restaurant along Rue Claude Monet and you can even sample some of the recipes from the artist’s own cooking journals.